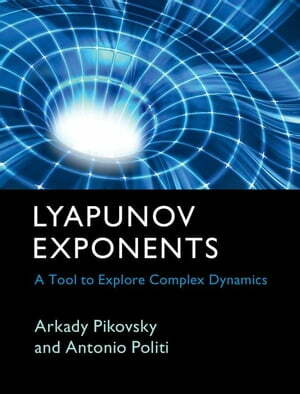 Collins Booksellers - Lyapunov Exponents by Pikovsky, Arkady, 9781316468708. Buy this book online. Lyapunov exponents lie at the heart of chaos theory, and are widely used in studies of complex dynamics. Utilising a pragmatic, physical approach, this self-contained book provides a comprehensive description of the concept. Beginning with the basic properties and numerical methods, it then guides readers through to the most recent advances in applications to complex systems. Practical algorithms are thoroughly reviewed and their performance is discussed, while a broad set of examples illustrate the wide range of potential applications. The description of various numerical and analytical techniques for the computation of Lyapunov exponents offers an extensive array of tools for the characterization of phenomena such as synchronization, weak and global chaos in low and high-dimensional set-ups, and localization. This text equips readers with all the investigative expertise needed to fully explore the dynamical properties of complex systems, making it ideal for both graduate students and experienced researchers.